Now that we’ve made gyro meat, we just have to make gyro’s. I had my first gyro in Atlanta of all places. I still remember it. The meat carved off the spindle in front of me, the amazing flavor of the meat. Yum! So when I went to Greece, I was anxious to try a ‘real’ gyro. The thing that impressed me the most about a true authentic gyro in Greece, ironically wasn’t the meat… but the bread. It was so soft and voluptuous, it melted in my mouth around that delicious fresh made and carved meat. No boxed meat here. So now that we made our own meat, we had to make our own pita bread. It was surprisingly easy. It’s not unlike any other dough recipe… flour, water, yeast, sugar, salt, oil. But where it’s different is the cooking method. You let the dough rise for 20 minutes, then you roll it into balls and let it rise again (30 minutes). Then you roll it out into flat circles and throw them directly on the grate in a 500F oven (or on a pizza stone). They puff up, and cook in a matter of minutes. The pita bread was luscious and perfect. 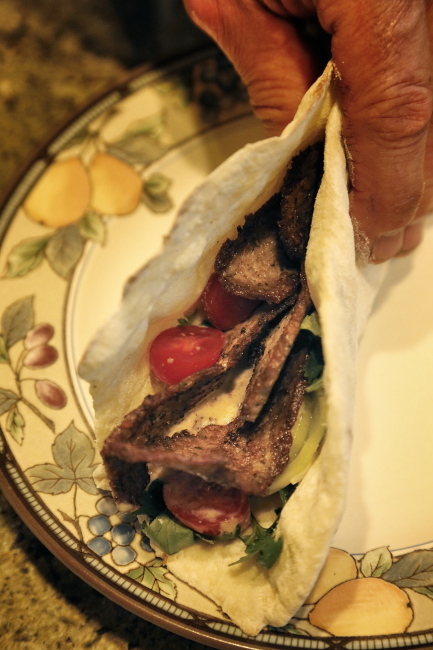 The perfect complement to homemade gyro meat… homemade pita’s. This entry was posted in What's For Dinner and tagged bread, gyro, pita on December 19, 2014 by kritterspaw.